Sign up to recieve monthly installments of the club! Clubs shipped mid-month. Add to your shopping cart or call 800-531-2607. 12 adorable 5" diameter Christmas stars by Raymond Crawford. Club includes everything you need: canvas, thread, needles, embellishments, and stitch guide. Shipping is free. These adorable felines from Associated Talents finish to beautiful standing piecies, perfect for decorating a mantle or table. The kittens are approximately 3x4.25" and the momma cat is about 3.5x7"
These adorable birds from Labors of Love finish to be about 2.5x4" (not including the tail) and look great displayed anywhere in your house. Kit comes with everything you need to stitch these great pieces: canvas, thread, needles, embellishments, and stitch guide. Shipping is free. A an adorable group of canvases from Sew Much Fun that finsihes into 3D shelf sitters representing a cute Thanksgiving scene. Boys and girls measure approximately 7.25 x 4 inches. Kit includes everything you need to stitch these adorable standups: canvas, threads, needles, embellishments, and of course, the stitch guides. These festive pieces finish into great stocking holders for your mantle! Finished size is 15x5x5.5 inches. Kit includes everything you need to stitch these gorgeous creatures: canvas, threads, needles, embellishments, and stitch guide. Shipping is free. These festive pieces finish into great stocking holders for your mantle! Finished size is 15x5x5.5 inches. Kit includes everything you need (except the canvas!) to stitch these gorgeous creatures: threads, needles, embellishments, and stitch guide. Shipping is free. Canvas is NOT included in this kit-only version of the club. Full Kit version is also available, and includes canvas. 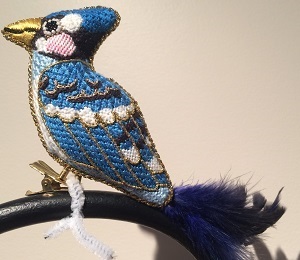 These adorable clip-on birds make a great accent to your Christmas tree or home décor. They finish into approximately 4x3" pieces, excluding the tail. Each canvas consists of two sides! Kit includes everything you need to stitch these gorgeous creatures: canvas, threads, needles, embellishments, and stitch guide. Shipping is free. 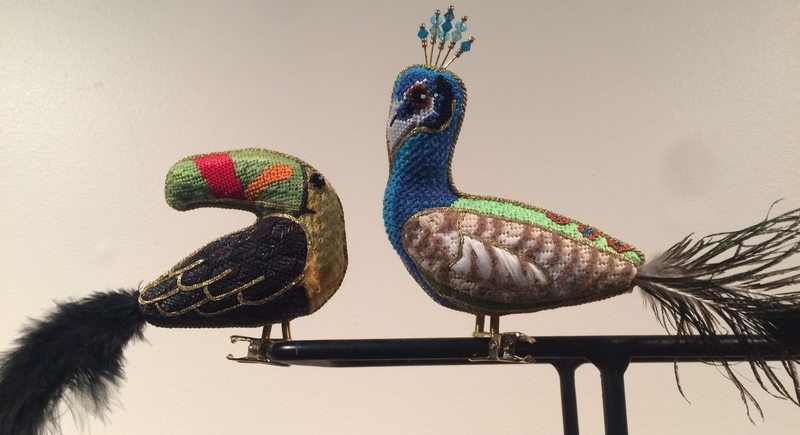 These adorable clip-on birds make a great accent your Christmas tree or home décor. They finish into approximately 4x3" pieces, excluding the tail. Each canvas consists of two sides! Kit includes everything you need (except the canvas!) to stitch these gorgeous creatures: threads, needles, embellishments, and stitch guide. Shipping is free. Canvas is NOT included in this kit-only version of the club. Full Kit version is also available, and includes canvas. Little advent ornaments with winter and Chrismas themed designs. Two days per month, with three for the last month. Each day has 2 designs - number and picture. Includes everything you need to stitch these adorable pieces; canvas, threads, needles, and stitch guide. Adorable cone shaped Santa ornaments from Little Shoppe Canvas Co. 18 mesh, finiished size approximately 4x3" Includes everything you need to stitch these adorable pieces; canvas, threads, needles, and stitch guide. 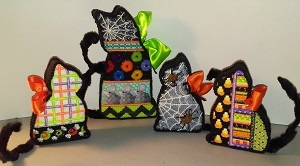 We've added more to our series of Halloween Danglies from Sew Much Fun! These"scary" 3 dimensional stand-ups sit on your mantle or table and dangle their legs over the edge. Sign up for 1 or all. The boides of finshed pieces are 6 to 7" tall, the legs another 2-2.5" long. Everything you need is included and shipping is free. 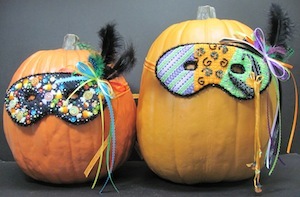 These Halloween Masks from Associated Talents will make a great addition to your halloween decorations. Just put them on a pumpkin for an perfect balance of cute and mysterious. Kit includes everything you need: Canvas (measuring approximately 7 x 3"), threads, needles, embellishments, and stitch guide. Shipping is free. 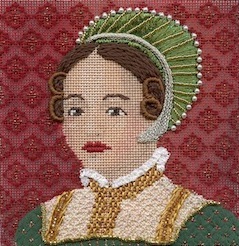 Also from Labors of Love - the companion club to Henry VIII and His Wives - his kids! Stitch guide and embellishment selection by Palma Seljan. 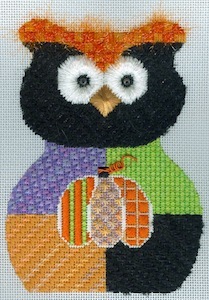 Kit includes everything you need: threads, needles, stitch guide, canvas, and all embellishments. Shipping is free. Three Dimentional Christmas (Chrissy) Cat from Sew Much Fun! The canvases in this club have lots of unique and interesting stitches, and the finished piece measures 10 x 7". Includes everything you need: canvas, threads, needles, embellishments, and stitch guide. Shipping is free. These Danglies from Sew Much Fun can sit on your mantle and dangle their legs, hanging off of whatever you choose. Much like our Christmas Danglies, these adorable characters will make a great addition to your home. 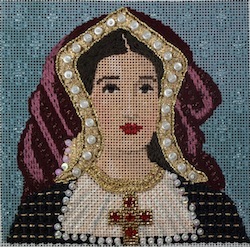 Each canvas measures approximately 4.75 x 6.25"
From Labors of Love - Henry VIII and his six wives. 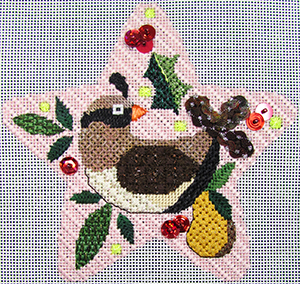 Stitch guide and embellishment selection by Palma Seljan. Kit includes everything you need to make these ladies shine: hand painted canvas, threads, needles, stitch guide, and all embellishments. Shipping is free. From Labors of Love - Henry VIII and his six wives. Stitch guide and embellishment selection by Palma Seljan. Kit includes everything you need to make these ladies shine, EXCEPT CANVAS: threads, needles, stitch guide, and all embellishments. Shipping is free. 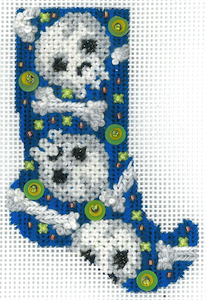 These cute little witch socks by Associated Talents have lots of fun stitches and make great ornaments. 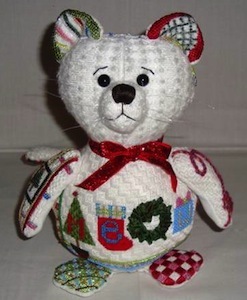 Canvas, threads, needles, and all embellishments are included. Shipping is free. 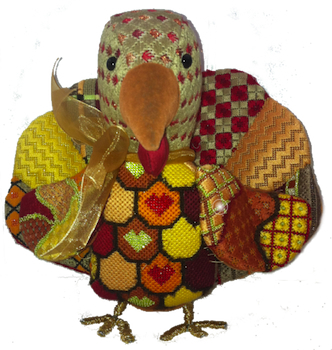 Three Dimensional Thanksgiving turkey from Sew Much Fun! Lots of fun threads and unique stitches. 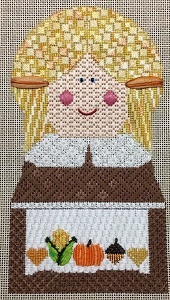 Canvas, threads, needles, embellishments and stitch guide is included. Shipping is free.